The mechanical fuel pump failed during my most recent flight, not on the fuel side but on the oil side. I lost oil pressure crossing to downwind at my home airport and was able to pull power and land without incident. Unless you want to call oil all over the engine compartment (especially co-pilot side) and drooling out of the cowl to coat the underbelly an incident. I originally thought it must be a blown oil hose but finding none, finally traced it to the lower weep hole of the fuel pump. Have you ever had or heard of a fuel pump failure of this type? Is there a recommend non-Rotax replacement part that might be cheaper than the $176 Rotax part? Quite the lucky incident, glad you weren't hurt. 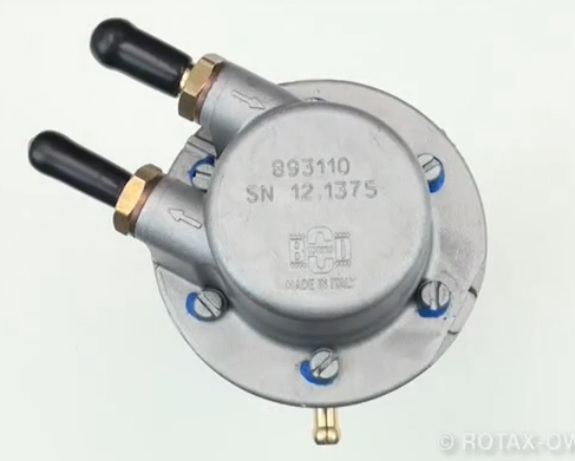 Rotax issued a SB a few years back and offered a kit that required shipping back the old pump�I replaced mine at that time for $100. The part number is listed below on the outside chance they�re still in stock somewhere. No, it was original with my engine from 2009 timeframe. Why do you ask? Was it the newer �Corona� style pump? I have a brand new fuel pump - - extra. Bought when others were having a problem. Never needed it. I'll look at it this PM for the numbers and let you know exactly what it is. I pulled the engine out of my Pulsar just this afternoon. The 912 UL is for sale. My son (( a Delta 777 and RV-6 pilot )) and I are exploring converting the Pulsar to electric. We don't know what to hell we are doing, but hey,, it's an experimental, isn't it ? ? ? That would be great if it’s a match. The number stamped on it is 08-002579.